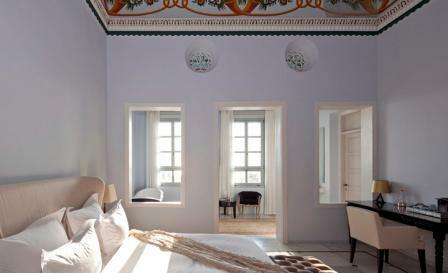 The conjoined Ottoman-era stone buildings that now form the Efendi were restored and converted into a 12-room hotel in northern Israel by local entrepreneur Uri Jeremias. Boutique architecture firm Arstudio restored the intricately painted ceilings, wood friezes and carved cornices, and an interior by Orit Kolonimos features armchairs by Moroso and Tom Dixon’s cast-glass chandeliers, which cling to vaulted sandstone arches above an imposing six-metre dining room table. Public spaces, including a wine cellar converted from Crusader and Byzantine ruins, can be found in the hotel’s southern structure, while a 400-year old hammam was transformed into the spa. Covered terraces overlook the rooftops of this Unesco heritage city.